I’ve been performing comedy for nearly 2 years (or 102 gigs, depending on whether you prefer imperial or metric measurements). 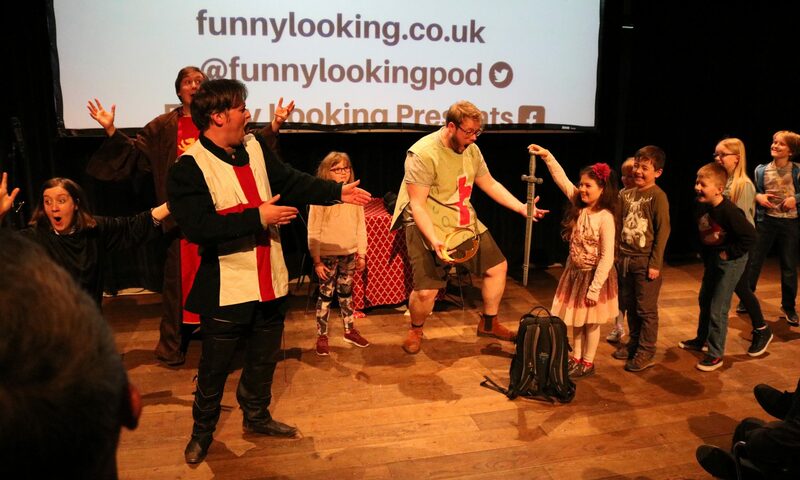 In comedic terms, I’m still a toddler, but, I’m a toddler who has written extensively about his experiences in comedy (see my gig diary: www.poursomegravyonme.co.uk). Think of me as some kind of weird precocious baby whose favourite toy is an abacus. So when the Funny Looking Fellas asked me to write this piece about the original intentions I had for my my comedy writing and how they’ve changed, I knew it was time to drop the ridiculous childhood analogy and just write the bleeding thing. After thinking about it for thirty seconds, I realised I could brilliantly answer the brief in one sentence: “My only intention was to try and be funny and that’s still true now.” And while in some ways it is true, it’s also ’s also far from telling the whole story. I’d never performed in any capacity, or even considered it as a possibility, until my friend Vic suggested in late 2010 that I should try stand up. I’m a lifelong comedy fan and being funny has always been important to me, so the idea really appealed; I just didn’t know where to start. I’d been expressing my humour online for a few years – on my stupid blog “The World of Sherby” (www.sherby57.co.uk) and a sporadically released podcast “The Gravy Boat” (http://thegravyboat.podbean.com) – so the idea of generating funny content wasn’t entirely foreign, but thinking of stand-up material was quite a different prospect. Seriously. Stop and think about it for a minute. Where would you start? Even if you knew what kind of comedy you’d like to do, or if you’re a naturally funny person in everyday life, what would you say if you were actually on stage? My first gig would be in May 2011, so I knew I had a few months to generate material. I just needed to find a mechanism to do so. As I wanted my material to reflect my sense of humour, the only method I could think of was to write down everything that I said, or thought of, that made me laugh. After a few months, this resulted in several notebooks full full of ideas which ranged from fully formed ‘Christmas cracker’ jokes (http://poursomegravyonme.co.uk/2013/01/29/i-dont-like-jokes-oh-no-i-love-them/) to weird little thoughts that made me laugh for no particular reason. Although I still didn’t have any usable material, at least I had some building blocks. OK. So, I’m sat with a pile of (possibly) humourous lego, which I want to turn into a shiny, new car (comedy routine). Surely I now needed to unfold some instructions (intentions) with which to achieve my goal. Well, yes and no. When I looked to expand the daft thoughts in the notebook, I concentrated on trying to make them funny in a way that was funny to me. This was a case of repeatedly saying them out loud and trying to add something funny to each subsequent iteration. As the individual chunks of material took shape, I then had to work out how they’d be presented and linked together. Fortunately, this also didn’t require a master plan. Because my ideas were all essentially nonsense, and because I like acting daft, there was a natural way for me to perform the bits. I was influenced by the sort of comedy that I didn’t want to do, and the things that I wouldn’t say. Another factor was the compulsion to add a layer of self referential ‘jokes about jokes’. Although it might seem self indulgent to introduce meta-comedy into your first set, it actually came from a need to be honest. Having watched a lot of comedy (and being a good decade older than the average newbie comic), I had become acutely aware of how even the most honest stand-up set was actually a construct. My knowing winks at the audience would be my way of saying “yes…yes…I know I’m lying, but it’s just for fun.” In many ways, it felt almost inevitable what my routine would be. In the subsequent couple of years, I’ve added a few methods for creating different types of material, and developed an increasing awareness for what does – or doesn’t – work for me, but but this primarily remains the way I produce material. Clearly, the idea of “just being funny” isn’t entirely true. I don’t sit down with a blank page and write with a specific purpose in mind, but but I do have a clear idea of what I want to achieve with my comedy and the journey on which I want to take the audience. A functioning piece of stand-up material rarely arrives fully formed. The process of turning an idea into a bit, which then fits into a routine, which then fits into the structure of a set, is one that requires work. It’s a process that is inherently filtered by your own likes, dislikes, taste and intent. For someone who has only performed 100 gigs, this is all exceptionally grand talk. At my level, the ultimate aim is still to just be funny on a consistent basis. Ste Price will be appearing in Multi-Levelled Morons at this year’s Edinburgh Fringe (Jeykll & Hyde, 13:30 daily). He would like to point out that he’s in character in the photo and so isn’t the pompous jackass that it makes him appear. You can find out more about Ste at my web-site, here. Pour Some Gravy On Me – thoughts on random stuff, including the gig diary. The World Of Sherby57 – lots of stupid stuff. Very stupid stuff.